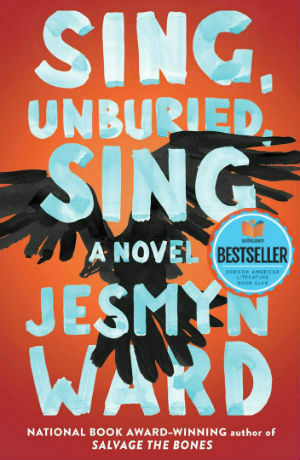 What Jesmyn Ward offers the reader in Sing, Unburied, Sing is an example of family. Ward creates a family that sees ghosts, a family that talks to animals and plants, a family that is part of both the natural world and the spirit world. Ward’s created family is assaulted by addiction, by imprisonment, by murder, by racism and by economic disadvantages. But through it all, the family remains connected. The theme of family support is strong throughout the text. Ward extends family ties beyond death. Given or “not Given” is a brother, son, and uncle in the text; he is murdered in the story, and he does not pass on to the sprit realm. His violent death causes him to roam; however, his roaming provides aide to his sister, Leonie. “Not Given’s”s (Given as a ghost) appears to Leonie when she is actively getting high. He serves as a reminder that her life is larger than crystal meth, and that she has a family and responsibilities. Ward does not sugar coat the destruction of the crystal meth; the reader sees the painful choices of an addict, the diseased selfishness that restricts the addict from being a mother, daughter and wife. But even within the self-centered life of an addict, Ward has Leonie make a sacrifice for family, a sacrifice that takes her to near death. Ward’s Leonie is a complicated character; one who tries to grow despite addiction, but crystal meth proves a powerful foe. Ward gives her moments of family love. Moments when family tradition wins out, and there are scenes where Leonie relies on the gifts that have aided her family for generations. But the novel is reality based, and Leonie is a practicing addict not looking for help. The rawness of such a life is not softened in the work. Ward strips away American pretense in the novel, and not only with addiction, the harsh tenants of racism are also expertly laid out in the story. Wards interracial couple would have been unbelievable in a lesser writer’s hands. The Black sister of a murdered Black boy falls in love with the first cousin of the white murderer. Ward crafts a love story battered by generational racism. Mixed children are produced from the love and thusly ostracized by the white boy’s family. But the family of the Black girl loves the children with all they have. Again, Ward takes a painful reality and illustrates how family works, how family dependence leads to individual survival. When Ward writes about the family surviving imprisonment, she writes of America’s brutal prison system that holds so many poor people captive. She shows how easily one’s life can be destroyed by the system, how youth is taken, how innocence is stolen, and how injustice is historically rampant. She does not shy away from the racial disparities in the system, corrupt inept lawyers, white privilege in criminal investigations, Black youth incarcerated as adults, or the unfair sentencing of Blacks. She writes of a system attacking with a purpose, a gathering of poor people by an inhuman institution. In Sing, Unburied, Sing Ward writes about racism, addiction, and mass-incarceration… by showing the reader a family experiencing trauma of each. The family is not America’s perfect family from the 1950’s, but instead a real family from the 2010’s, a spiritual family that uses the traditions of the past to survive today. In the novel, there are ghosts, there is acceptance, there is confession, there is death, and there is family love. Read Scribner’s description of Sing, Unburied, Sing .